When I read a quilting, recipe, knitting or other craft book, I read it from cover to cover including pattern and recipe details, general instructions, etc. I enjoy every bit of it provided it covers a subject of interest to me. I am often surprised at the things I learn, which I would have missed had I only read the pattern or recipe I was looking for or liked. 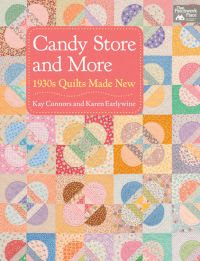 Such is the case with "Candy Store and More - 1930s Quilts Made New" by Kay Connors and Karen Earlywine, recently published by Martingale. Surely, I expected to see patterns with dresden plates, pinwheels, baskets and pieced flowers made with era-inspired prints. What I found was an eyeful of beautiful quilt designs, as Kay and Karen deliver on their promise to make 'new' treasures out of old favorites. The icing on the cake: their commentary at the beginning of each pattern, showcasing original newspaper clippings and information about block origin which, along with their book introduction, took me on a journey to the Depression Era and helped me see those blocks under a new light. If you like 1930s-inspired fabrics and quilts you will be delighted with this book. To get you in the mood, grab a box of Sugar Babies, a couple of Musketeers bars, sit comfortably and enjoy!